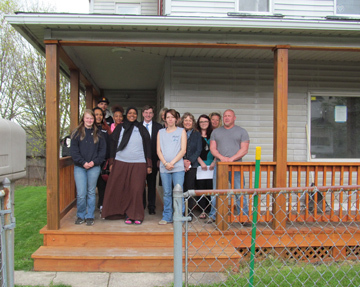 JOHNSTOWN, PA, April 20, 2015—Congressman Keith Rothfus (R PA-12) and two of his staff members visited the worksite today of a house in the Moxham section of Johnstown that students who are enrolled in Goodwill’s YouthBuild Johnstown Program are currently renovating as part of their on-the-job training. The congressman was accompanied by Deputy District Director Allison Beresnyak and Constituent Advocate Jose Luis Otero. YouthBuild Johnstown is a 6–11-month education and job training program for individuals ages 17–24 who live in Johnstown and meet eligibility requirements that represent barriers to becoming economically self-sufficient. Students spend a portion of their time in class earning their GEDs and/or improving basic skills in which they are deficient, and spend another portion in paid on-the-job training in construction. Well-qualified students may be able to pursue training in healthcare and welding. Students gave Congressman Rothfus and his staff a tour of the two-story home and explained the renovation work that they are doing. After the tour, Rothfus spoke directly with the students, asking them how the experience is positively changing their lives and congratulated them for deciding to enroll in the program to better their lives. Two students shared portions of personal essays that describe their lives before joining the program and how positive they feel now about their futures. Goodwill began operating the program in 2007. Since the program’s inception, students have renovated 64 apartments, remodeled 22 houses, deconstructed 7 properties, and assisted with the building of 4 new homes. In addition, 158 youth have participated in the program, 94 obtained a GED and/or certification, and 57 were placed in employment or postsecondary education and training. Enrollment Now Open – Download and complete application. Enrollment is currently open for the next YouthBuild cohort that will begin on June 8. Anyone who knows of youth who would benefit from the program is encouraged to refer them to contact Mindy Rickabaugh, Program Manager at (814) 536-3536, ext. 291 or mrickabaugh@goodwilljohnstown.org and to visit the YouthBuild Johnstown Facebook page.